I know I have mentioned this to you all before, but I am an oatmeal lovin' freak. I have it for breakfast in some form almost every single day. Instant, steel cut, baked - I love it all. 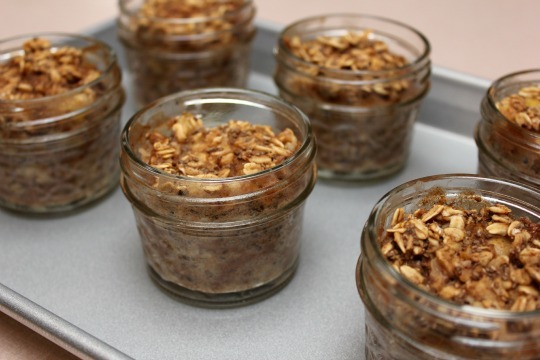 These little cuties are a great way to enjoy baked oatmeal on the go. Store them in the fridge and then pop one into your bag to enjoy when you get to work, school or whatever. Preheat oven to 350 degrees. Remove lids from 6 jelly jars (4.2 oz). In a large bowl, mix together the oats, chia seeds, cinnamon, nutmeg, salt and baking powder. Add the almond milk, vanilla and maple syrup and stir until combined. Fold in the fruit and chopped nuts. Keep stiring the mixture so some of the milk will absorb. Divide the mixture between the six mason jars, about 1/3 cup in each. Bake at 350 for 22-25 minutes on a small baking sheet, or until slightly firm and golden on top. Allow to cool completely for about an hour before placing them in the fridge. Eat them cold or microwave for 30-40 seconds. Note - I purchased the jelly jars from Wal-mart - they come in a case of 12.